Bormio - Santa Caterina has ski slopes all levels. Skiing with a unique elevation over 1800 meters to 10 kilometers long slope unforgettable. Bormio FIS belongs to the family-centers, are held here regularly World Cup races, World Cup skiing and many other plants. Lombardia, Alta Valtellina. The elegant Hotel Cristallo is located at the beginning of the historic center of Bormio, just 300 meters from the thermal baths "Terme di Bormio." The recently renovated Hotel Miramonti Park has a quiet location and the center Borma is just a few minutes walk. Residence Cristallo is located in the historical center of Bormio, 300 meters from the thermal baths "Terme di Bormio." Pleasant, family-led hotel has an excellent location. From the center of Bormio is located about 200 m.
Apartments "Fortuna" located in different apartment houses in the ski resort of Bormio. From the center of Bormio located approximately 2km. Hotel Girasole is situated 9 km from the center of Bormio, with shops, bars and restaurants - the center of Bormio in 2000, but directly on the slope. The hotel is built in a terraced style with intrinsically linked to the way parts of the holiday villages. The Comfort Hotel Sant Anton is situated in a quiet area, just 300 meters from the historic center and the elegant sports resorts of Bormio. Altitude of the resort is 1250 meters. Hotel Villa Rina is located about 1km from the center of Bormio. Hotel Posta is located in the center of Bormio with shops, bars and restaurants. The recently renovated Hotel Olimpia has a quiet location and the center of Bormio is located only 300 m.
Family run Hotel Daniel is located about 200m from the center of Bormio in the main street towards the resort of Santa Caterina. Hotel Aurora is located just 200 meters from the center of Bormio, with shops, bars and restaurants, airport 220 km Milan. Serena Apartments are located in Bormio, 500 meters from the center with shops, bars and restaurants. The recently built cottage in typical Alpine style situated in the heart of Bormio. Wonderful environment in a wide and sunny valley on the border of the Stelvio National Park with hot springs "Terme di Bormio," Bagni Nuovi e Veche ". Altitude of the resort is 1250 meters. The Hotel Nazionale is located near the historic center and Spa Bormio. Baita del Sole Apartments are located directly opposite the cable car station in the resort of Bormio, about 500m from the center. Chalet Funivia newly built apartments are located 250 meters from the center of Bormio, in a pleasant residential area. Hotel Capitani is located in the popular resort of Bormio on edge about 100m from the center, near the famous Spa. Residence Jolly is located only about 200m from the center of Bormio, 2min walk from the main pedestrian zone. Hotel Derby is located in the resort of Bormio about 500m from the center. Chalet Santa Barbara is conveniently located near the center of Bormio, shops 200m, restaurant, bar 30m. The recently built residence / hotel 3 Signori is located in the pleasant village of Santa Caterina Valfurva directly at the slopes and about 200m from the center. The recently built hotel / residence 3 Signori is located in the pleasant village of Santa Caterina Valfurva directly at the slopes and about 200m from the center. Valfurva Residence is located in a typical alpine village of S. Caterina Valfurva just 150m from the center at an altitude of 1738 meters, about 12 km from Borma. Residence dello Stelvio is situated in the center of San Colombano, about 3 km from Og and a few miles from Bormio. Hotel National Park is situated in the valley of Bormio, Livigno towards, about 9 km from Bormio. The closest shopping facilities 500m. Rosengarden apartments are situated in a quiet environment, near the center of town Isolaccia. This area of the Roman thermal baths and a new spa complex. Apartment house is conveniently located for the ski resort of Bormio and Livigno. Altitude of the resort is 1350 meters. The residence is located in the center Isolaccia, 100m from bochodov and about 8 km from Bormio, 50 km from the railway and 200 km from the airport. Partially renovated Hotel Del Cardo is located near the center Semogo (1460 m asl), the middle road between the centers of Livigno and Bormio. Residence Castello is located about 150 m from the center of Bormio is situated about 4 km and from S. Caterina Valfurva 20km. Altitude of the resort is 1250 meters. are leaders in Italy, despite the narrow slopes (comparing. 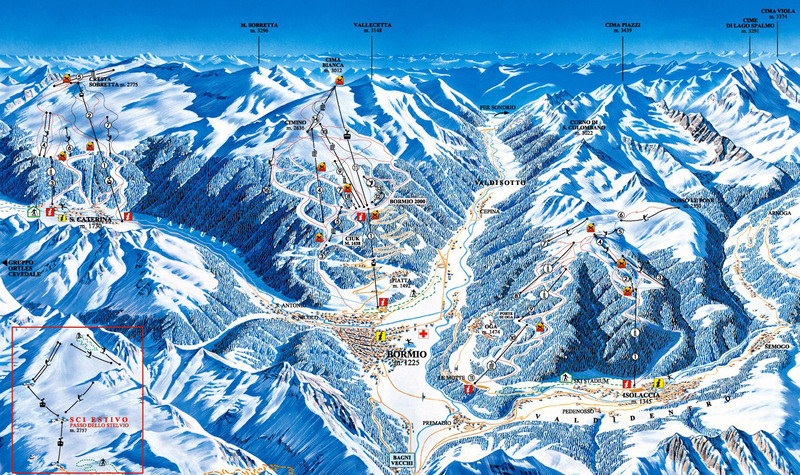 neighboring Livigno) Bormio is suitable for more experienced skiers. Partial sections and snow park will enjoy a less proficient beginners who are at least feel the atmosphere of "serious" skiing. The most famous ski resorts in neighboring Alta Valtellina are Livigno, Santa Caterina, San Colombano or on the Swiss side of the world-famous St. Moritz. More possibilities of skiing offered in further ski resorts in Italy can be found here - Skiing Italy.